I served this up to notorious terrible eater Dave, and it got 2 thumbs up!! Roasting the kale and pine nuts really gives it a great flavor, and I actually just used salt and pepper and a little more than a “drizzle” of olive oil while roasting kale and I didn’t need any dressing at all! However, I will include the dressing that came along with the recipe in case you want to try it out. 🙂 Healthy, light, flavorful and filling! 2. Start dressing. In a small bowl measure out your olive oil, lemon juice, zest, honey, salt & pepper. Give your garlic clove a good smash and drop it in. You’re going to fish it out later, after it sits and infused garlic into the flavor of the oil (alternatively, just mince it in). Set aside while you work on the other components. 3. Drizzle whole kale leaves with olive oil, salt & pepper. Spread into a single layer on a baking sheet (you might need two). Bake in the oven for 8-12 minutes or until the edges are crispy and the centers are wilted. Remove from oven, let cool to room temp. Stack the leaves and chop them, removing the more coarse parts of the stems. Set aside. 4. Start the chicken. Heat oil in a small skillet and cook through. Sauté with oil, balsamic, salt and pepper. 5. Back to your dressing. Fish out the garlic clove (it’s ok if some bits stay in, just try to remove the larger pieces of the skin). Whisk in tahini, cheese or nutritional yeast, water if necessary to thin it, and a few red pepper flakes. Taste and adjust seasonings to your liking. More lemon for tartness, more cheese to mellow it out if it’s too tart for you… etc. 6. 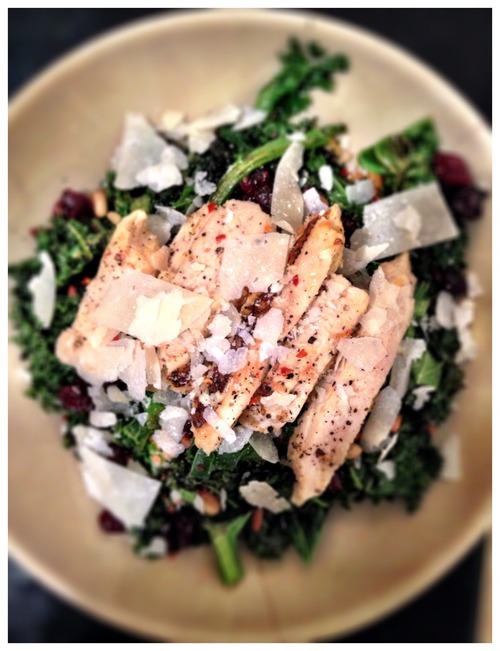 Toss kale leaves with (some) of the dressing, add as much or little as you like, to taste. Add cranberries, parsley, and chicken pieces and toss again. Plate and garnish with pine nuts & more grated cheese and red pepper flakes.